I am a volunteer at the Archives and have been working on cataloging one of their pamphlet collections into PastPerfect, an online catalog that is available through PAHRC's website. That way, instead of blindly searching through boxes, all you need to do is a search through the database to locate a pamphlet. Something interesting that I’ve come across are several pamphlets about miracles. Three pamphlets published between 1810 and 1830 are about live-saving, miraculous cures. Two in particular caught my eye because they were about the same woman, Ann Mattingly, whose story has recently become popular with the release of the book Mrs. Mattingly’s Miracle, by Nancy Schultz. 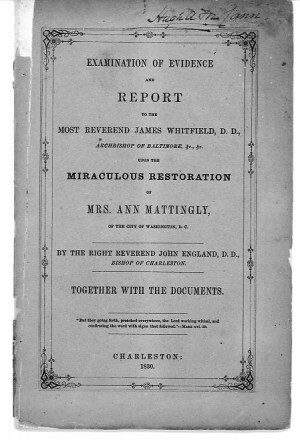 The two pamphlets examine Ann’s extraordinary cure and give evidence that a miracle saved Mrs. Mattingly’s life. The first pamphlet was published in 1824, the same year as her recovery. It begins with two letters, one from William Matthews, Rector of St. Patrick’s Church in Washington DC, and one from Reverend Ambrose Marechal, Archbishop of Baltimore, who both profess their belief in Mattingly’s miraculous cure. Her ailment began in 1817, when she began to feel pain in her left side. Her left breast gradually became more and more painful, until “she could distinctly feel a small lump at that spot, about the size of a pigeon’s egg.” Doctors failed at relieving the pain, and in 1818 Mattingly “was seized with a violent puking” which continued for days. After this, she was unable to leave her bed for months, though she was visited consistently by doctors. The account of her miraculous recovery was signed and affirmed by Ann Mattingly herself. The pamphlet goes on to include other witnesses’ versions of the miracle. Mattingly’s sisters, sister in law, and friend were all present at the time of her cure, and each swore oaths to the truth of the event. There are also accounts from other friends, family members, clergy members and doctors, who each swear to Mattingly’s pious and honest character, as well as their full belief that a miracle occurred. In all, there are thirty four sworn testimonies, each declaring a true miracle was performed. The second pamphlet about Ann Mattingly was published in 1830. Her story had drawn much attention all over the country. So much so, that the Reverend John England, Bishop of Charleston, requested the incumbent Archbishop of Baltimore’s permission to reinvestigate and reexamine the evidence. 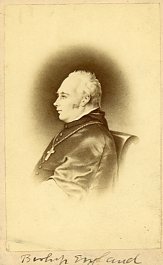 James Whitfield, who succeeded the Reverend Ambrose Marechal as Archbishop of Baltimore, granted his request. Thus, the second pamphlet is a collection of the Reverend John England’s observations and inquiries into the case. He does a complete investigation, first quoting and citing references found in the 1824 pamphlet, then showing how each assertion made in the original story was repeated and affirmed by multiple witnesses. He not only looks at previously collected evidence, he speaks to the witnesses again and chronologically organizes their statements to create a narrative of events. His investigation is much more thorough than the original pamphlet and in extreme detail shows how up to the minute of her recovery how dire and grave Ann Mattingly’s condition was. England, John. Examination of Evidence and Report to the Most Reverend James Whitfield, D.D., Archbishop of Baltimore, etc, etc. upon the Miraculous Restoration of Mrs. Ann Mattingly, of the City of Washington, D.C., Together with the Documents. Charleston, 1830. Print. Matthews, William. 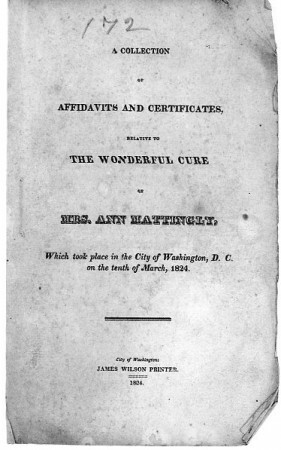 A Collection of Affidavits and Certificates Relative to the Wonderful Cure of Mrs. Ann Mattingly, Which to place in the City of Washington, D.C. on the tenth of March, 1824. Washington, D.C.: James Wilson, 1824. Print.